Valentine’s Day is just around the corner, with the first month of 2018 having quickly come and gone. And that means it’s time to start thinking about plans with your loved one. Luckily, North County has a cornucopia of choices for romantic Valentine’s Day dinner date choices. It helps, of course, to have a slew of cities — such as Oceanside, Carlsbad, and Encinitas — with restaurants dotting the coast of the Pacific Oceans, a romantic undertaking in all aspects of the word any day of the year. The beautiful hills running rampant throughout inland North County, too, don’t hurt in that regard. Put more simply, North County’s not a bad place to be if you’re looking to ignite the romance on that special day. Here’s a list of places to get you started in your planning process, broken down on a city-by-city and restaurant features basis. So don’t procrastinate, as Valentine’s Day is one of the busiest nights of the year for most restaurants. Read the guide, pick a spot and make your reservations now! With a large wine menu and expansive, reasonably-priced delectable dinner menu, Villa Capri Ristorante is a winner all around. It doesn’t hurt that you can continue your romantic night with a post-dinner ice cream jaunt with your date at the nearby Baskin-Robbins, located within the same shopping center at the Piazza Carmel. Like Villa Capri, Trattoria Ponte Vecchio has a big and tasty Italian dinner menu, as well as a sizeable wine menu. It also features a great view, in this case located across the street with window views of the Los Penasquitos Lagoon and a Pacific Ocean view on the horizon. It’s a great place to go after taking a stroll along Torrey Pines State Beach and taking in its awe-inducing cliff formations. And if you’re looking to hang out and relax a bit post-meal, head on over to the next-door IRIS Food & Spirits for some wine, beer or cocktails. Jake’s Del Mar has everything you need in a piece of real estate: location, location, location. Located along the Pacific Ocean on the shores of Del Mar, Jake’s is renowned for its Hula Pie dessert, but its dinner menu won’t disappoint either. Dinner menu items include Seafood Chowder Soup, Shrimp Roll, Ahi Poke Bowl, other seafood dishes and various burgers and sandwiches. In case you were wondering what a Hula Pie is, it’s a chocolate cookie crust, macadamia nut ice cream, hot fudge, toasted mac nuts, whipped cream. Jake’s also has other dessert items on the menu, including a pecan pie tart and a chocolate peanut butter torte. Wednesday nights also feature $7 mai tai drinks (normally $13) and if you’re not a fan of that drink, you have dozens of other mixed drinks, beers or wines to choose from. Looking for 5-star dining? Seeking out the crème de la crème? Addison Del Mar is your place! For $110, you’ll get a meal made by Chef William Bradley. Addison also features an exquisite wine menu, though bringing your own wine is also an option, and the restaurant bills itself the only 5-star/5-diamond in southern California. A night at the movies is always romantic and Cinépolis Luxury Cinemas allows for guests to do the double: dinner and a movie, all in the same place at the movie theater. Featuring a full food menu and also traditional movie theater snacks and candy, Cinépolis also maintains a large coffee drink menu if you’re seeking a post-meal pick-me-up. The theater flush with full leather recliner seats features a push button concept, wherein if you need food or a refreshment during the show, just push the button and out comes a waiter or waitress. The theater went through a full renovation in 2017 and opened for business in 2011. Major caveat: the theater will not be open on Valentine’s Day, but if you’re looking to celebrate a day early or a day late, the theater is screening the romantic film classic, “The Notebook” on February 13. That movie will also screen at the Vista, CA location for Cinépolis at the same time, which features a bit smaller of a menu than the Del Mar locale. Located across the street from Jake’s, Poseidon Del Mar has large wine and cocktail menus and a large dessert menu. It will also serve a Valentine’s Day special four-course meal. Serving up a Valentine’s Day special three-course meal, Pamplemousse Grille has a set rate of $135 for the evening. The restaurant also has about a dozen cocktail choices made with top-flight liquors. Bring your date with for happy hour, which runs from 4:30-6:30, for 40% off drinks and stay for dinner. Chart House’s menu features meats, seafood, various fish and other dining room delights for dinner. It has one of the best ocean views in all of North County. Cardiff’s beachfront area is one of the prettiest in all of North County, so spend some time pre-meal walking around the area by the Pacific Ocean or at San Elijo Lagoon State Marine Conservation Area. Located just off of Highway 101, Solace & The Moonlight Lounge has a slew of seafood choices for a reasonable price point. Given its plum location, you’re not far from a pre- or post-dinner movie, some ice cream post-meal or a beer at one of the many area bars. The restaurant also has full beer and cocktail menus and stays open late. An Italian restaurant in business since 1994, the massive authentic menu at Vigilucci’s Trattoria will not leave you lacking in options. Vigilucci’s also has a location in Carlsbad. A stone’s throw away from the ocean, Chandler’s at Cape Rey Carlsbad has an outdoor patio and a quality dinner menu matching its quality view. Seafood reigns supreme at Chandler’s, which also features a full dessert and cocktail menu. Twenty/20 Grill & Wine Bar is offering a 3-course meal Valentine’s Day special for $65, with multiple choices for each course of the meal. For another non-traditional and fun Valentine’s Day evening, make a reservation at Green Dragon Tavern & Museum, which triples up as a restaurant/bar, coffeehouse and a Revolutionary War museum. Unlike most museums, Green Dragon allows patrons to view exhibits with a drink in-hand. The dinner menu features a wide range of choices, mostly ranging from $20-$25, give or take on either end of that price scale. 333 Pacific is serving up a four-course Valentine’s Day meal for $60 per person. The restaurant features a view of Oceanside Pier, the longest wooden one of its sort on the west coast at 1,954 feet and of course a beautiful view of the Pacific Ocean. For a place that doesn’t take itself too seriously, hop into Masters Kitchen and Cocktail, situated in a former car repair shop. During its heyday as an auto repair shop, it was the only one located in North County, going by the name Masters Automotive and Repair Shop. While not technically a fancy restaurant, at least of the five-star variety, the stylish locale features equally stylish menu items, including small plate tapas choices and various entrées and sandwiches. Looking for a good dessert to share between two? How about Vanilla Bean Cream Brule or Pumpkin Spiced Latte Cheesecake? The drink menu, per the “cocktail” in the restaurant’s name, is also immense, ranging from wines, cocktails and a surprisingly wide-ranging beer list. If you don’t want loud music to impede your date night, however, this might not be the place for you. That night, the Corey Leal and Band – a mix of blues, soul, and classic rock music – will play from 6:00-9:00 PM. Small plates, pizza and pasta, oh my! Feliccia’s Italian Restaurant features authentic food ranging from pizzas cooked at 900-degrees in a wood-fired stove, about a dozen pasta choices and about another dozen meat or fish choices. 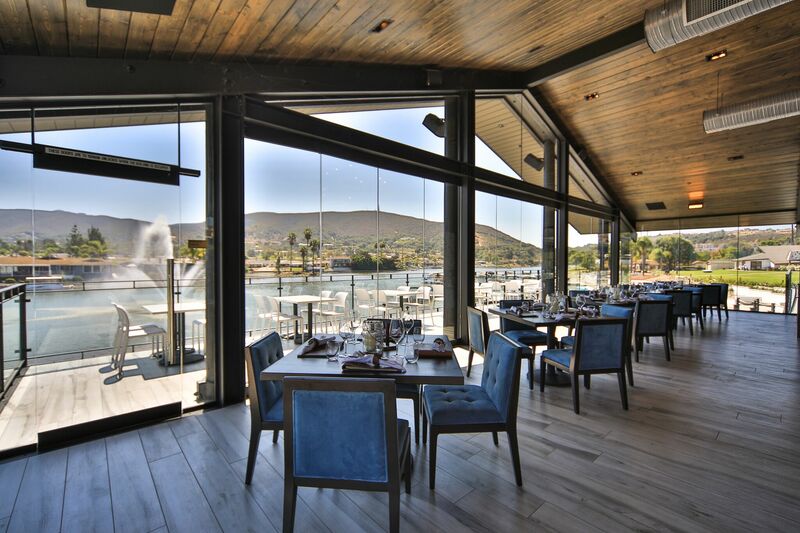 Ocean views are usually the first thing that come to mind when you think about San Diego and its North County, but Decoy Dockside actually is situated alongside Lake San Marcos at the Lakehouse Hotel & Resort. Decoy is playing host to a Valentine’s Day dinner this year, a three-course meal costing $75 per person which includes music from acoustic guitar soloist Christine Parker. Vintana’s Wine + Dine is serving up a three-course meal for Valentine’s Day, which includes seafood and meat choices, as well as vegetarian options, too. As the name implies, Vintana’s also has a robust drink menu, including 20 different cocktails and a dozen different beers. Key lime pie and red velvet cheesecake are both dessert options. Head on over to Stone Brewery post-meal if you’re looking to extend the night with drinks. Up for dinner and a movie? Regal Cinemas Escondido is also just a few minutes driving away. If you’re seeking fine-dining for a reasonable price tag, Bellamy’s Restaurant is your jam. The restaurant also has an impressive array of six pages worth of wine choices. A center of French, upscale cuisine, Mille Fleurs will serve a four-course Valentine’s Day dinner for $135. The restaurant also has eight different cocktail choices and will have musical entertainment, as Wednesday through Saturday Mille Fleuers also becomes a piano bar. With a full wine menu and a mix of Italian foods and traditional European-style meat and seafood dishes, Nick & G’s Mediterranean Chop House has a sleek interior which will facilitate a romantic Valentine’s Day dinner. While its ala carte full menu will still be available, Nick & G’s is also serving up Valentine’s Days specials, as well. Found within the Rancho Valencia Resort and Spa, Veladora has a large list of seafood and meat choices, nine cocktail choices and a huge wine menu. The Valencia also features a beautiful wine room and its Pony Room, which has a 20-page tequila menu and its own beer/wine list and dinner menu, which itself has a large drink menu. Pony Room prices for food, on average, are half of that of Veladora. Villa Capri Trattoria features a full Italian food menu, with average menu items going for about $16-$18. The restaurant also has a wide-ranging wine menu.